During the past two decades Swaminarayan Aksharpith has published five booklets on alcohol, smoking, AIDS, eggs and heart disease as part of BAPS Swaminarayan Sanstha’s anti addictions programme. Since then there remained a demand for a booklet on vegetarianism. By the blessings of HDH pramukh Swami Maharaj and guidance of Sadhu Ishwarcharandas Sadhu Mukundcharandas has now written this booklet. In such a short work it is only possible to offer a brief account of the various arguments to avoid flesh. In fact west more and more people are eschewing animal foods and swishing to a vegetarian diet. In the US more than 12 million people are vegetarians. In the UK in 2006 an estimated 3.5 million about 5.6% of the population were vegetarians and 0.25 million vegans. Israel with over 4% has the second highest number of vegetarians in the world after India. However in the land of the holy cow and the origin of vegetarianism the reverse trend is becoming vogue. More Hindus especially the affluent are eating flesh to flaunt their wealth in high society and to be trendy. 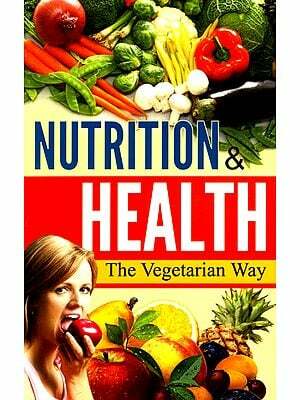 For them the karmic argument and concept of compassion may remind them of India’s pristine vegetarian legacy for Hindu youths swayed by the strength argument this book offers compelling scientific evidence many examples of world class sports celebrities and body builders who are vegetarian. Hence this booklet may prove useful to coaches training young body builders in Gymkhanas. Those wishing to adopt a vegetarian diet fear that one has to eat only bland tasteless vegetables. However there are hundreds of delicious and exciting dishes that Indian vegetarian cuisine has to offer a few simple recipes for newcomers are listed in Appendix 8. Many people in the west well informed by the media about the effects of diet on their health and the environment are increasingly resorting to vegetarianism. This is not the case however for young Vaishnav Hindus in India and those abroad. Though they may have been vegetarian because of their religious beliefs and to a certain extent regional and cultural traditions ruralite migration to cities and those to foreign countries have greatly influenced them to add flesh and eggs to their diet. A key culprit has been the ill informed Indian physician who often recommends and touts eggs as class a proteins and prescribes non vegetarian supplements for covalescene. The gullible ruralite the uneducated and the weakly swallowing any product prescribed as being healthy. However it has been over half a century since the concept of class A Proteins and class B proteins has been totally overruled by the western community. Yet this has failed to penetrate the Indian medical institutions who continue to perpetuate it today! To hindu migrants one important factor that added flesh and other non vegetarian foods in their diet was the act of migration itself. For many this meant a freedom from their traditional ties now in their adopted homelands they were free to do as their resident counterparts. Explaining their religious beliefs to peers at school seemed more like a spike that goaded many Hindu kids. So when they couldn’t beat them they joined them. In many countries only the first generation migrants managed to continue their vegetarian diets. Some conveniently misinterpreted the concept of ahimsa as applicable only to cows and so avoided beef but saw no sin in relishing flesh of other animals. This sadly was and is the case among many Hindus in South Africa. 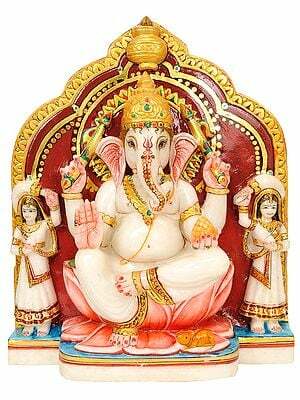 In the 70s Hindu Migrants from Africa to Canada and the UK managed to maintain their beliefs. However later their offspring posed searching questions to which many parents didn’t have satisfactory answers. So these first generation Hindus not satisfied with the faith argument followed by their non vegetarian peers in the school dining halls or covertly in birthday parties. For many young Hindu school children pocket money and easy accessibility to non vegetarian snacks and fast foods were and enticement too easy to pass up. 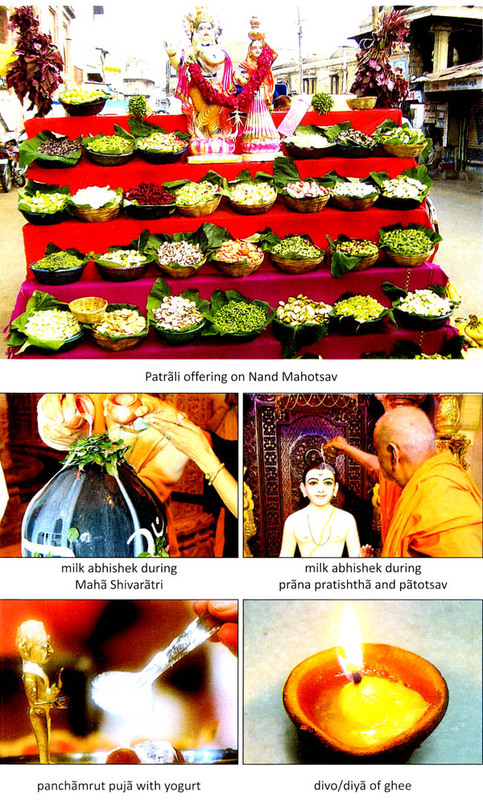 Only those Hindu parents who visited mandirs regularly or maintained strong cultural and religious ties with others in their community managed to successfully perpetuate the vegetarian ethic to their children. Such kids instantly reject popular sweets chocolates and energy bars with even a single non vegetarian ingredient such as egg lecithin Gelatin or cochineal. It is children with such diligence and fortitude who have grasped the true spirit of ahimsa and compassion. They will not compromise the slightest when pressured by peers or even parents. Such children can be seen in BAPS Swaminarayan centers abroad and in India. In Gujarat they belong to families whose livelihood is fishing and to tribals in the Panch Mahals and north Gujarat. Often these children have to bear the taunts and anger of their parents who wish them to eat flesh or take part in the slaughtering ritual of the animal. During such times these children have vegetarian food at a friend’s house. In one case a boy shut his eyes until his father completely plucked feathers from a chicken. He then ran outside to avoid witnessing the killing of the bird. In some cases the children’s firmness have melted their parent’s hearts who have subsequently become vegetarian. By request to reduce cost and brevity, this edition now only includes Hinduism's principles of vegetarianism. Related issues and information appear in the appendices and colour insert. 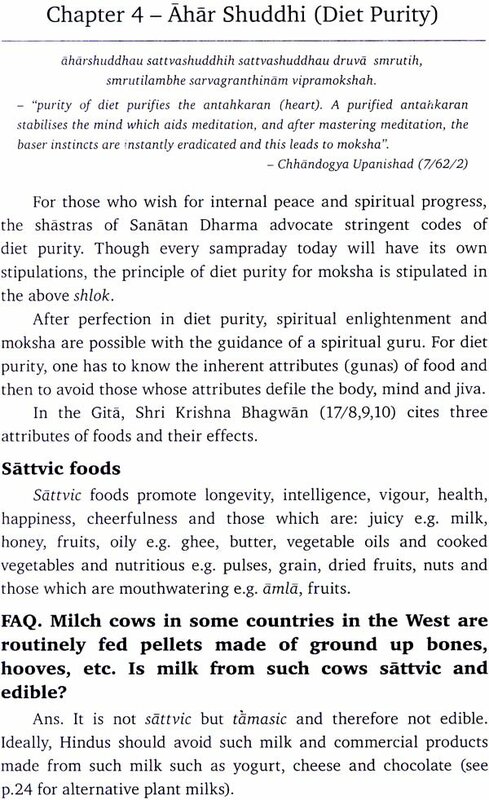 Since Hindus do traditionally use milk, yogurt and ghee in diet and religious rituals, the word 'vegetarian' in this book signifies 'lacto-vegetarian'. This booklet attempts to present vegetarianism from a Hindu perspective. Each chapter of the book begins with a relevant Sanskrit shlok from the texts of Sanatan Dharma, which convey the sentiments and foresight of its rishis and avatars. This helps readers to appreciate the vegetarian ethic from the Hindu viewpoint. This involves a brief examination of the Law of Karma, the concept of ahimsa - non injury, prana - and the concept of diet purity necessary, not only for a healthy physical life, but for inner peace and spiritual enlightenment as well. This may explain India's ancient tradition of incorporating vegetarianism as an integral part of its cultural and spiritual life. For Hindu readers, the book also hopes to induce pride for Hinduism's sublime ideals enjoined by the rishis, as embodied in the Sanskrit shlok cited above. More importantly, it hopes to infuse a sense of responsibility for all our karmas, reminding ourselves that our dharma is to imbibe compassion for all our fellow creatures, to help them live peaceful lives filled with happiness, which is their God-given right, realising fully that they too have intense bonds of love with their offspring, just as we have with our's.